In a world of belief, children enjoy magic and wonder throughout the year thanks to the Sandman, the Tooth Fairy, the Easter Bunny, and of course Santa Claus. But a dark shadow is consuming the globe, turning dreams to nightmares, and belief to fear. They told you there was no such thing as the Bogeyman; they were wrong. When Pitch Black, the one and only Bogeyman tires of hiding under beds he decides its time the children of the world started to believe in him. 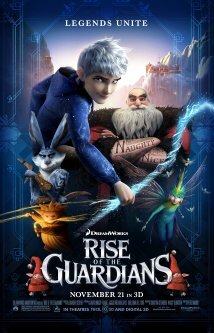 Fear spreads across the land and it's up the Guardians to stop him; the Sandman, the Easter Bunny, the Tooth Fairy, and Santa Clause. But they need help, Jack Frost. Bringer of snow days, and master of ice, the would-be hero is just out to have a good time but longs for the one thing he can't have; to be believed in. Invisible to the children of the world Jack lives a lonely existence. Reluctant to join the hard work of the Guardians, a chance to discover who he is brings him to the fold. But will they be a match for Pitch Black and his nightmares? Or is the belief of the world doomed to fear? An enchanting tale set in the modern world. The design alone gives a new unique twist to the well-known stories of youth. Santa; the burly tattooed, eccentric Russian. Bunny; the six-foot, boomerang slinging Australian. And more. Each character draws you in. Even our antagonist Pitch Black creates a sense of empathy, though usually overrides it with his whole evil-take-over vibe. But it's not just the characters that keep you engaged, the scenery and design is beautifully crafted. From workshop to warren, from frozen lake to vibrant town. Even the painstaking animation of crystal patterns forming on ice. A terrible amount of work was put into the visuals of the film and it was effort worth being made. Dreamworks didn't disappoint. Along with the visuals, the audio was certainly not to be sniffed at. The brilliantly composed music by Alexandre Desplat covers all the bases for setting the mood. From the bouncy scores of Santa's workshop, to the adrenaline poundings of sledge vs road, to the eerie trills surrounding Pitch Black. An exceptional soundtrack that doesn't rely on the modern day meld between current chart toppers filtering into the sequence. Just well composed music and an orchestra of talented musicians. And not forgetting the one who brought it all together. Peter Ramsey, more often known for his storyboard art than his directing, has been relatively quite in recent years however has proven himself to be at the top of his game with this well pulled off movie. Though lacking a huge financial hit in the US compared to its budget, this quietly proud story deserves far more recognition that it has gained. Both emotive, funny, and enchanting, this is a film for any age. From the wide eyed believers, to the older nostalgics. The film sets out a host of characters we know and love, with a few modern day twists. So sit back and enjoy, but ask yourself one thing; do you believe?